When did Ngambri Descendants Reclaim their Identity? The Ngambri and other Aboriginal communities in surrounding regions were herded like cattle on to missions and reserves in the late 19th and early 20th centuries. In the 1930s, most Ngambri descendants were at Hollywood Aboriginal Reserve at Yass in the country of our former enemies. By then, our elders were not allowed to speak in language. Some of our children were designated ‘white’ and sent off to ‘white’ foster families or children’s homes. It was a terrible time. We younger generations were losing our ancestral culture, language and identity. Great Uncle Roddy died in 1951. After Grandfather Lightning died in 1959, his three eldest grandchildren, Matilda, Harold ‘Crow’ and Arnold Williams, returned to their grandfather’s ancestral country in the Canberra region. Contemporary Commonwealth Government statistics confirm their statement that at that time there were few Aboriginal residents in the ACT and that most of these were at Wreck Bay. Back then, the Williams family was still identifying as Ngunnawal, the linguistic name of the original Wallabalooa and Burrooa groups from Yass and Boorowa respectively. Grandfather Lightning had rights to this country too, through his mother. His three eldest grandchildren established the Ngunnawal Local Aboriginal Land Council in Queanbeyan in 1984. Meanwhile, Yass-based non-Ngambri family members identified mainly as Wiradjuri and established the Onerwal Land Council in Yass. By 1996, we had recovered our Ngambri ancestral identity and began to identify as such, although like everyone else we have multiple identities, which we also acknowledge. Our Ngambri identity, however, is paramount. 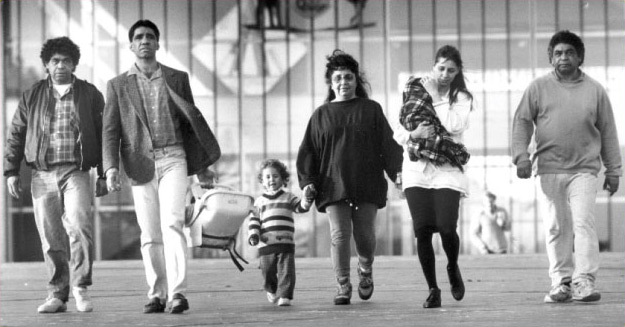 Arnold Williams (left), Matilda Williams House (centre), Harold ‘Crow’ Williams (right), with Joe, Charlie, baby Leah and Michelle House, take their challenge for rights to their ancestral country to the High Court of Australia, 1993. Photo reproduced courtesy of The Canberra Times. Why are there so Many Disputes over Aboriginal Rights to Country in the ACT? There are disputes between Aboriginal peoples over rights to country all over Australia, not just in the ACT. Such disputes are also prevalent overseas in other countries that have experienced invasion and some form of dispossession. Our country was a backwater before it was declared the capital of Australia. Even in the early 1960s, when the three eldest grandchildren of Grandfather Lightning returned to their ancestral country, they lived peacefully without challenge for at least a decade. Things changed from 1971 when Canberra became the centre of pan-Aboriginal protests against the Aboriginal policies of the incumbent Prime Minister, William McMahon. Locally, disputes over rights to Ngambri country escalated after the Native Title Act became law in early 1994. It was then that our non-Ngambri Ngunnawal relatives began claiming rights to country in the ACT through their links to Ngambri families. Eventually there were three claimant groups, including bona fide Ngambri descendants. In 1996, the ACT Government under the leadership of then Chief Minister Kate Carnell persuaded ‘all three groups to unite as one’ to increase the chances of being awarded some native title rights in the ACT. Ngambri descendants were forced to acquiesce temporarily due to funding limitations. Effectively, non-Ngambri Ngunnawal had to piggy back on the Williams family genealogies in order to demonstrate a ‘connection to country’ in the Canberra region. These disputes are as yet unresolved. To date, the only achievement regarding rights to country for Ngambri descendants is sharing joint management with non-Ngambri people, including non-Aboriginal representatives, on the Board of Namadgi National Park. How do Ngambri Descendants Intend to Settle Ongoing Disputes? The Ngambri realise that global events way beyond our control have led to our ancestral country becoming occupied by non-Ngambri peoples from all over the world as well as from other regions of Australia. Over the past 40 years in particular, our elders felt helpless as the tide of false claimants to Ngambri country flooded over us. Now we, the next generation of Ngambri leaders, are ready to take on these ongoing battles in an atmosphere of reconciliation. We, the younger generation of Ngambri leaders, understand that governments are in the business of governing and that decisions about various issues have to be made quickly even if they are wrong. While co-operating with governments, we are quietly and slowly in the process of developing strategies to strengthen our Ngambri base and our connections to our ancestors as well as to our elders and our descendants. We Ngambri descendants believe that those who make false claims to a Ngambri identity will eventually have to confront their own consciences and also bear the judgement of our ancestors, so we are learning to ignore these usurpers and move on with our own agenda. Canberra, the capital of Australia, has been accused of being a city without a soul. We disagree. We, the Ngambri People, are its soul. We, the younger generation of Ngambri leaders, on behalf of our Ngambri ancestors, elders and descendants, assert the authenticity of our unique Ngambri identity. The capital city of Australia, Canberra, is derived from the name of our country, Ngambri, and our People: the Ngambri. While it is true that most Ngambri families have Ngunnawal as well as other ancestry, this does not mean that all those identifying as ‘Ngunnawal’ have rights to Ngambri country or to claim a Ngambri identity. The term ‘Ngunnawal’ refers to a language that is no longer spoken fluently by any descendants identifying as such and is therefore a superfluous group descriptor. Ngunnawal was a language once spoken by the neighbouring Wallabalooa (Yass) and Burrooa (Boorowa) peoples. It was not a language spoken by the Ngambri. Many people claiming to be ‘Ngunnawal’ in modern times have identified with Wiradjuri and other language groups for generations. This is a problem for the Wallabalooa and Burrooa elders to resolve; these people have no connection to the Ngambri. We humbly request that all references to the ‘Ngunnawal’ are expunged from ACT Government documents, that all ‘Welcome to Ngunnawal Country’ signs are removed, and that the ACT Government’s “United Ngunnawal Elders’ Council” be disbanded. We also humbly request that the ACT Government ends the practice of paying non-Ngambri usurpers to conduct ‘Welcome to Country’ addresses. We, the Ngambri People, will provide the ACT Government with solid evidence of our claims to country, our individual identities, our numbers and other relevant information. We intend to compile a list of traceable descendants of known Ngambri ancestors who lived in the 19th century. We will then gather together bona fide 21st century descendants and, following a series of internal workshops on revised lore and custom for modern times, we will also advise on the agreements over who can and cannot claim rights to country in the Canberra region. We ask only for the respect and acknowledgement due to us as bona fide Ngambri descendants and that non-Ngambri Aboriginal and Torres Strait Islander peoples now living in Ngambri country respect our protocols just as we respect yours when we visit or reside in your ancestral countries. We intend to make peace in particular with the bona fide elders of the Wallabalooa, Burrooa and Pajong groups surrounding Ngambri country as well as with Canberrans of all other ancestries. Like all Canberrans, we wish to make the world a better place for our children and to ensure we maintain our ancestral identity for the sake of future generations. We believe this is important for all Canberrans because, without the Ngambri, the capital city would truly have no soul. Ngambri children receiving their certificates of achievement for their participation in the production of the Tales From Ngambri History early childhood readers, December 2003. 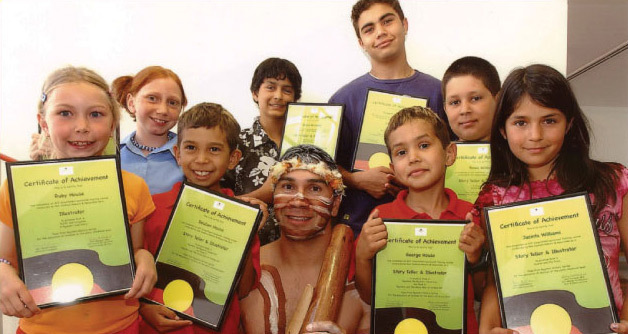 From left to right: Ruby and Leah House, Reuben House, Dylan Williams, didgeridoo player Paul House, Robert Williams, George House, and Travis and Jacinta Williams. Photo by Martin Jones reproduced courtesy of The Canberra Times. In remembrance of the 86th anniversary of the death of our Ngambri/Ngurmal Ancestor and all other Ngambri/Ngurmal descendants who were dispossessed but not entirely destroyed by the first waves of European invasions of our ancestral country. To be presented to the Chief Minister of and Minister for Indigenous Affairs in the Australian Capital Territory. Presented on behalf of the Ngambri/Ngurmal People by Paul House, fifth generation descendant of Henry ‘Black Harry’ Williams. To ACT Chief Minister Jon Stanhope on behalf of the Ngambri and Ngurmal People, Past, Present and Future, in whose country the modern Australian Capital Territory of Australia now stands. We, the Ngambri and Ngurmal People, wish to declare in this, the 86th anniversary year of the death of our Ancestor, Henry ‘Black Harry’ Williams, our Ancestral Rights to Ngambri and Ngurmal Provenance and to the special respect of all Aboriginal and non-Aboriginal peoples now living on our Ancestral Lands. We make this declaration in a spirit of Peace and a desire for Harmony with all peoples of the modern ACT and surrounds, including our own near and distant non-Ngambri relatives from surrounding areas. Please be advised that we are about to start on an historical journey to heal our ancestral belonging place by paying our respects to our Ngambri and Ngurmal ancestors and to reassure them of our determination to maintain our special Ngambri connections to this region. Our main aim is to establish an atmosphere of mutual respect through the acknowledgement of our Ngambri and Ngurmal Ancestors and recognition of our rights to declare our special place in the pre- and post-history of this region. On each anniversary of the presentation of this petition, up to and including the special celebrations due to take place in 2013, we intend to update the Chief Minister, Members of the ACT Legislative Assembly and the wider population living in our Ancestral Country on the findings of our special journey. Allow us to remind you that the name, Canberra, is a corruption of the pronunciation of our clan and our country, Ngambri. The first ‘white fellers’ pronounced and spelled it ‘Canberry’ and it was gazetted as such in 1832. Just as we have learned about your history, please learn about ours. As we have shown you respect today and have declared our desire for Peace, please respect us and our special place in the cultural history of this region. Please also be aware always of how much we have lost and how hard we are striving to repair the desecration of our ancestral country and the spirit of our land.